Dumbo is directed by Tim Burton, and is a remake/adaptation of the classic 1941 Disney animated film. It stars Colin Farrell, Michael Keaton, Alan Arkin, Danny DeVito, Michael Buffer, and Eva Green. Max Medici, the owner of a traveling circus, invests money in a pregnant elephant, adamant to make the baby elephant the star of his show. But when the elephant is born with abnormally large ears, he’s anything but confident in his investment! His mind changes when the baby shows the unusual talent of flying using his large ears, quickly boosting the popularity of the circus shows. It isn’t long before outside sources, including the owner of a successful amusement park, set their sights on having the star attraction in their own shows, much to the surprise of Medici and his troupe. Disney has been cranking out numerous live action/CG hybrids of many of their animated classics in recent years (though honestly I haven’t seen many of them as of the time of this writing). 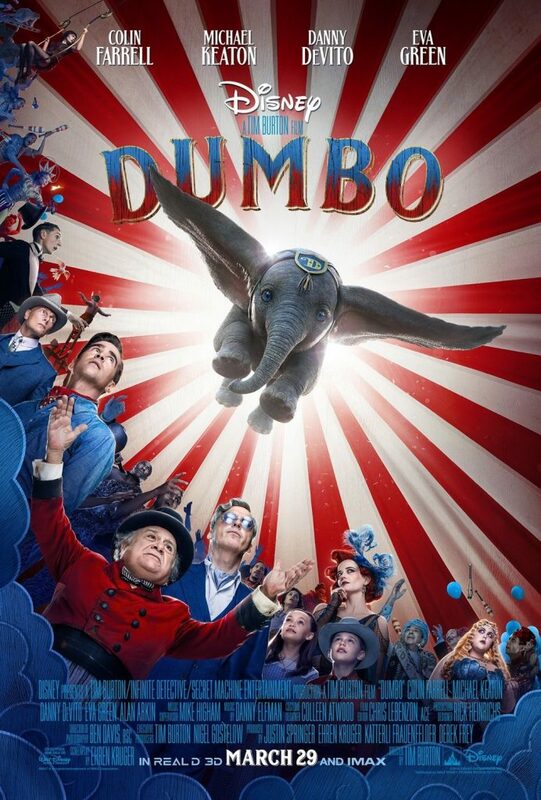 With the classic tale of Dumbo the elephant as the source material and charismatic, stylistic director Tim Burton at the helm, this new incarnation of Dumbo should’ve been one of the year’s best films. Instead, it’s overplotted with far too many unnecessary human characters and subplots, and an excruciatingly long run time which is roughly double the length of the original animated film, of which this incarnation lacks the heart and soul. 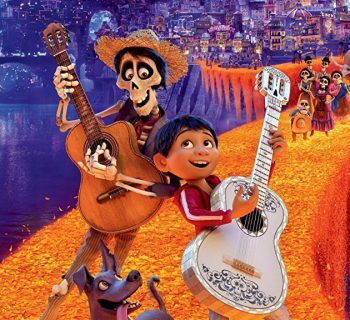 While casting is solid enough, the big-name stars are left with little to do or say, and many moments may be too frightening for the family audiences the movie is supposedly being marketed to. If nothing else, no one can fault director Tim Burton’s images and set design. The man has a visual style all his own, and while it’s a little less pronounced here than in his more mature productions, he certainly has a way with the movie’s 1919 setting. Whether we’re seeing a city from a distance, a traveling circus, or an amusement park, Burton still manages to leave a touch of his own. The scenes in which Dumbo appears, whether he’s flying, rehearsing, or missing his mother who was written off as a “mad elephant” following an incident and sold off, are truly magical despite other flaws in the movie. 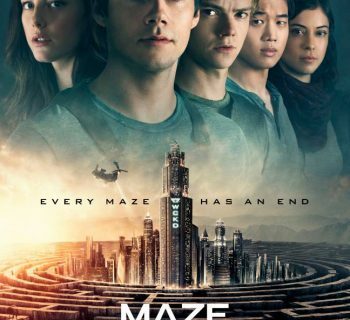 Although I’m not sure to feel about how the movie utilizes them, the cast members are solid enough for who and what they are. The true stand-out of the film is Danny DeVito as circus owner Max Medici, who steals every scene he’s in with his bumbling nature and witty one-liners. Had the movie placed more of an emphasis on him, odds are I’d be writing a stronger review for the film. Instead, the movie is flooded with countless unnecessary secondary characters. Eva Green is basically given nothing to do but put on costumes and look pretty. Even the central “family members” and the troupe members are largely one-dimensional and uninteresting. And was it really necessary to put Michael Buffer in the film, performing a play on his widely-known catchphrase, considering a Progressive Insurance commercial already did just that? One surprise is, given the Disney label, how much of the movie is of questionable appropriateness for children. I understand a Tim Burton movie isn’t going to be all smiles and sunshine, but there’s a reason the man has rarely made films for a youthful audience. Within the first few minutes of the film, the central family is reunited with their father who’s returning from World War I, and he’s missing his arm. Was this really necessary? 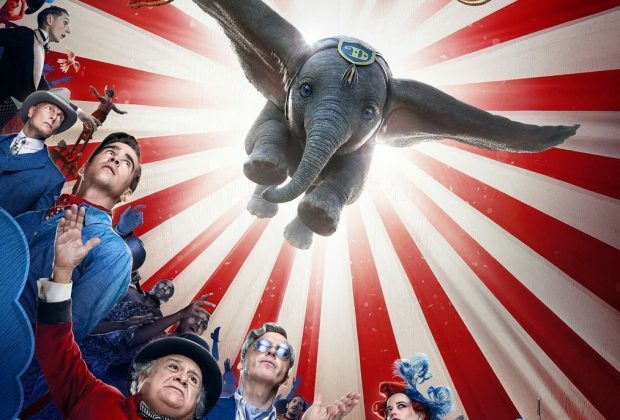 Following an incident involving Dumbo’s mother which results in the death of a ruthless animal trainer, he’s implied to have died, and a coroner’s vehicle can be seen on the circus grounds, with Medici being interviewed by police. Michael Keaton’s amusement park owner is menacing, and with his “raspy voice” moments throughout the film, it sounds like he’s unnecessarily conjuring up the ghost of Beetlejuice. Many of the images of Dumbo and human characters in peril, along with an amusement park in flames, don’t feel like the stuff of PG cinema or something appropriate for the youngest of children. At the screening I attended, loud and crying children had to be escorted from the theater on multiple occasions (though I can’t officially confirm if this was because of the film’s content). While I wouldn’t say anything about the film was overly objectionable or bad, I do imagine it could be frightening to young children. A PG-13 rating would have been more appropriate. The last criticism I have stems from the fact the original Dumbo film was one of shortest in the entire animated Disney canon, yet told a very full story despite this. This movie’s twice as long, and meanders and drags in more than a few spots. When we’re not spending time with Dumbo, we’re bored and forced to endure unnecessary human characters and underdone subplots. Would you rather watch an hour-long animated movie which tells a very full story, or one twice as long which has gorgeous images but no heart or soul? Tim Burton’s take on Dumbo doesn’t soar as high as audiences would hope. There are worse family films in theaters now, but I’d recommend just waiting for the home release on this one. DISCLAIMER: Images in this review are the company of their respective copyright holders, including Walt Disney Pictures, Tim Burton Productions, Infinite Detective Productions, and Secret Machine Entertainment. For promotional use only. All rights reserved. 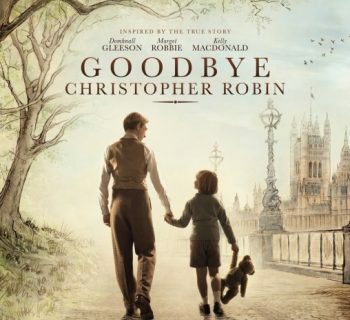 Goodbye Christopher Robin - An Amazing Cinematic Tale of Winnie the Pooh Creator AA Milne!